The very talented Teresa, from the blog Magazine Your Home, graciously shared her entire manufactured home’s transition with us a few months ago. 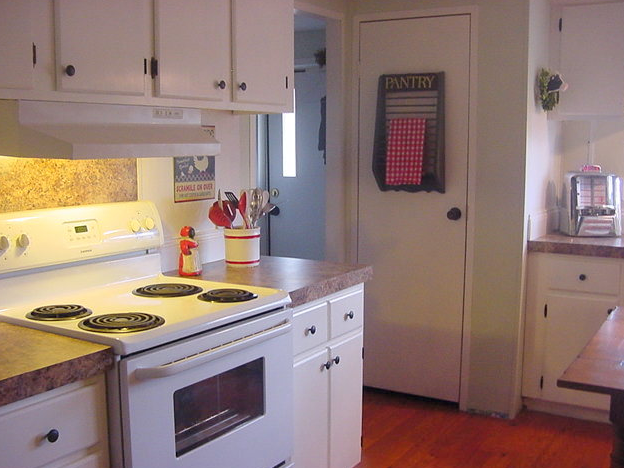 Today, she shares her double wide kitchen makeover! Teresa’s home and interview have always been popular, and for good reason, it’s beautiful and inviting. ‘Organic farmhouse’ is a good description for her style and decor. 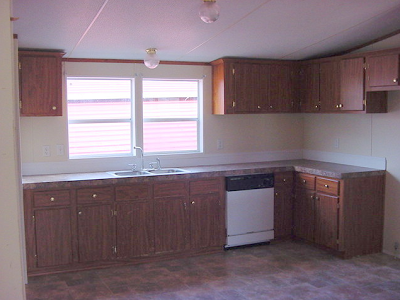 It really isn’t an easy feat to make a modern manufactured home look like an authentic farmhouse. But she does it gracefully and seamlessly. Her use of homemade items and secondhand finds add just the right touch to give the home a worn and comfortable ambiance that is so welcoming. New paint, flooring, and curtains are just the beginning of the changes. 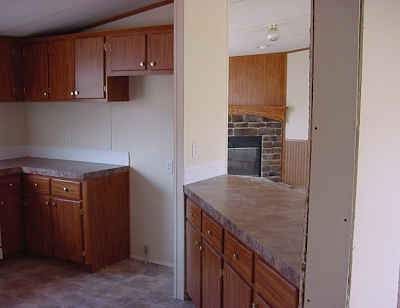 The before photos show the 1999 double wide manufactured home with all the standard features such as laminated cabinetry and narrow molding. You can save lots of money by purchasing a used but recent model home and remodel and update it yourself. In today‘s economy it pays to be smart with your money and not overspend on housing. Debt free is always better! Teresa shows that it is possible to live in a gorgeous home that’s also affordable. Teresa was gracious enough to answer a few of our questions for us. Her replies are honest and helpful. If you haven’t visited her blog, go now and see what a wide assortment of topics she covers. It is immensely entertaining. Teresa took out the built-in bar that separated the kitchen from the living and dining room to open up the space. By painting the cabinetry Teresa really opened the space up with light. Crisp and clean, with touches of country charm and organic accents, is a great style for those of us that like our homes to have the lived-in, comfy feel. 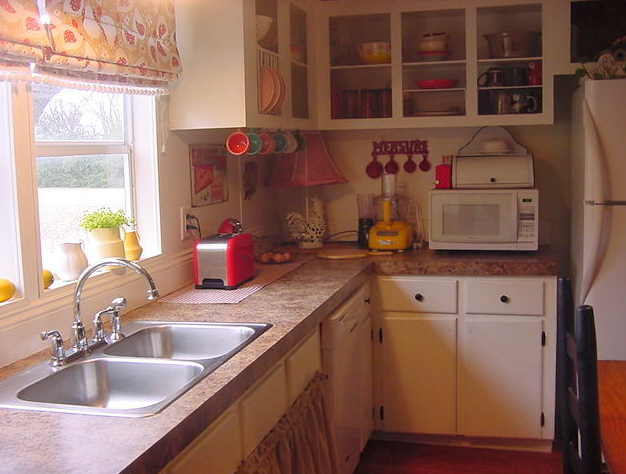 Related: 7 Affordable Ideas to Update Mobile Home Kitchen Cabinets. 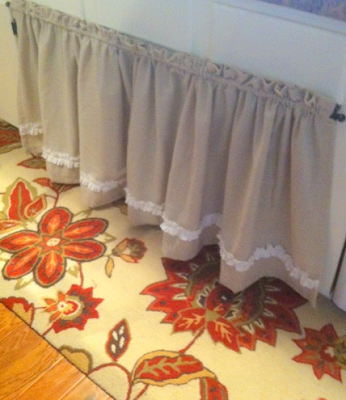 Under the sink, she uses a skirt to add soft texture and a bright rug for comfort and style. The room is full of antique items that recreates a warm setting of yesteryear. Teresa made the shades above the kitchen sink herself. Her dining room has a homemade chandelier that is pure genius. 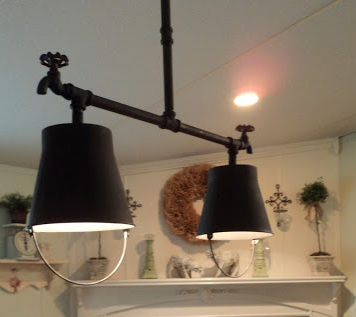 Two buckets, steel plumbing pipe and a couple of water shut off valves make a perfectly fitting fixture for the farmhouse decor. Adding truly homemade accents have really given this home the total look and feel of a working homestead. I’m sure you remember the dining room from the previous posts. It was a favorite update of mine! 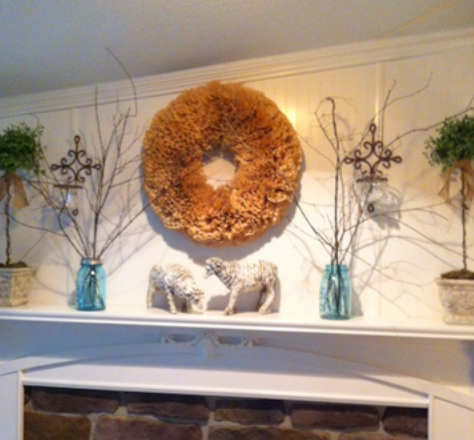 Teresa was able to change the entire look of the dining room fireplace with paint, bead board, and by adding a more prominent mantle. 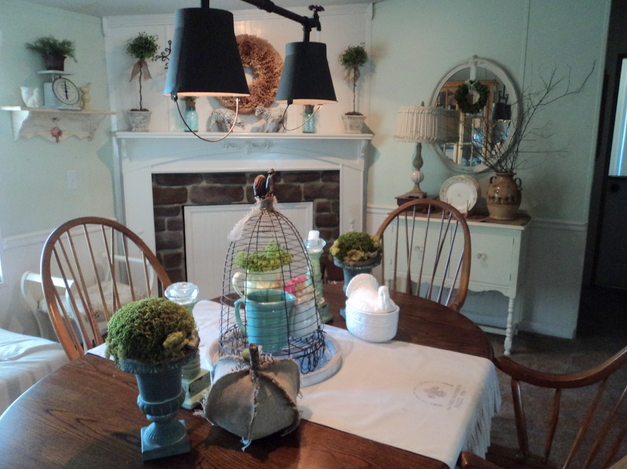 The room is set off by the country chic chandelier that Teresa made herself using pipe and buckets. 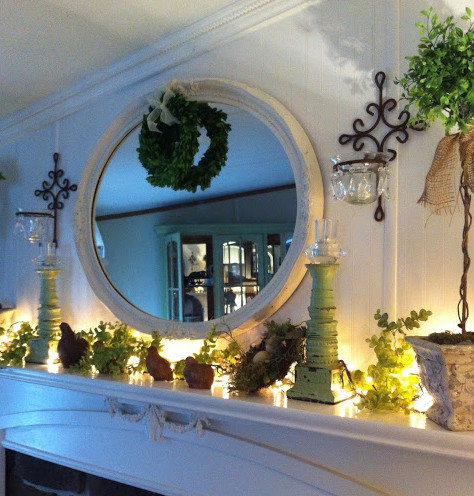 Teresa’s mantle and tablescapes are beautiful. She uses light, height, and color so well. Every item is married perfectly to a setting and becomes a unique work of art and adds depth and drama to the room. 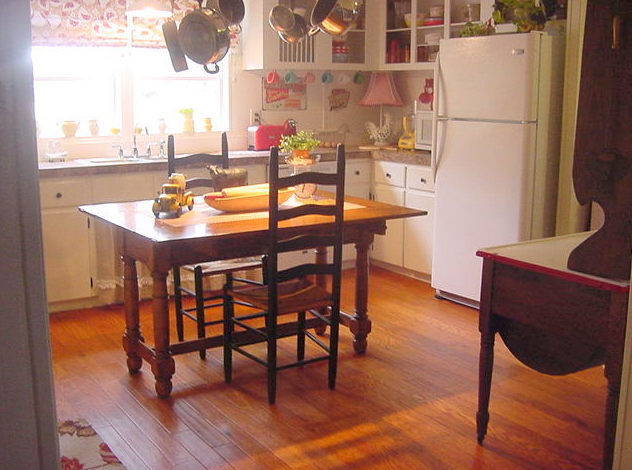 This is one gorgeous double wide kitchen makeover. 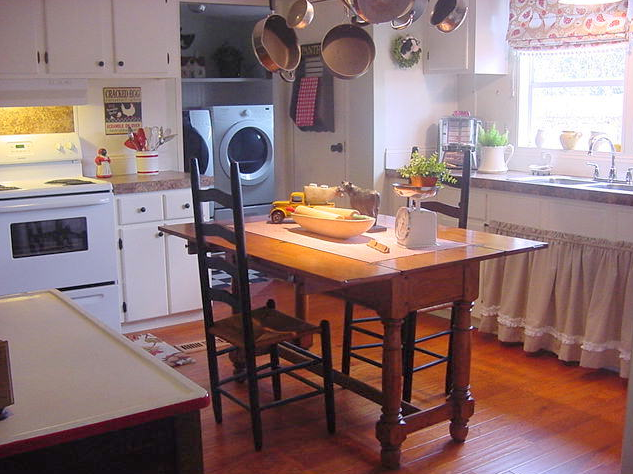 Teresa’s Double Wide Kitchen Makeover InterviewTeresa kindly answered a few questions for us. What was the most drastic change in your opinion? It’s a toss-up between the flooring and painting the cabinets. I think I would say the flooring because the before was so horrendous. What choices were the hardest to make? Actually once the cabinets were painted everything kind of fell into place. White always gives me a clean slate to do whatever style and colors tickle my fancy. I think using white paint makes just about anything look good.How did you pre-plan and prepare?I’ve been thinking about this redo for some time now and I like to keep pics of kitchens that inspire me via Pinterest. So when it came to the actual choosing my style I found that most of the pictures I had ‘pinned’ where of white cabinets, wood floors and with a Farmhouse flair. Once I had that nailed down I made a list of what comes first, ie. paint cabinets, sew Roman shades (what would I need), flooring etc. I also made a rule not to do any other projects until I was completely done with the first one on the list, that kept me on task. What was the hardest physical challenge? It’s going to sound crazy but it was the Roman Shades, those things sucked the life out of me lol. I now know why they charge an arm and a leg to get custom Roman Shades, they take forever! How did you choose the flooring. ?What features were you looking for? We wanted floors that were NOT a high gloss. We wanted floors with a feeling that they have been around for a long time something with a hand scraped look, with knot holes and variations in the color. Also, something that would last and stand up to our Golden Retriever. Did you ever doubt yourself or have buyers remorse over anything? Nope, I try not to look back, I stew over what to purchase for a while but once I’ve made a decision it’s full speed ahead! No, I’m pretty happy with how it all turned out. 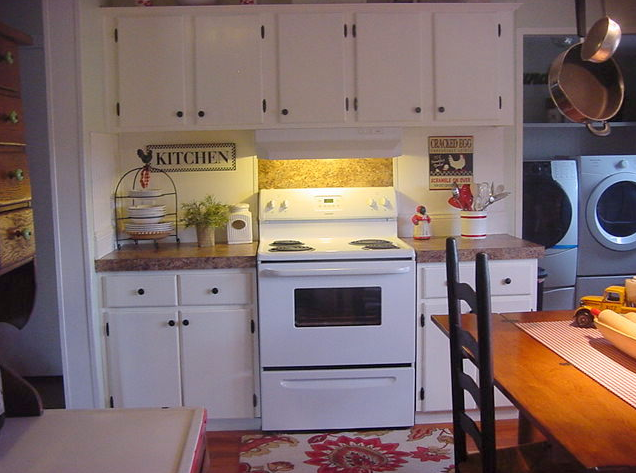 I do have a couple more things I would like to do to the kitchen down the road, such as adding a bead board or tin ceiling. I would also like to change the backsplash behind the stove. But all in all, I’m very content with my kitchen now. 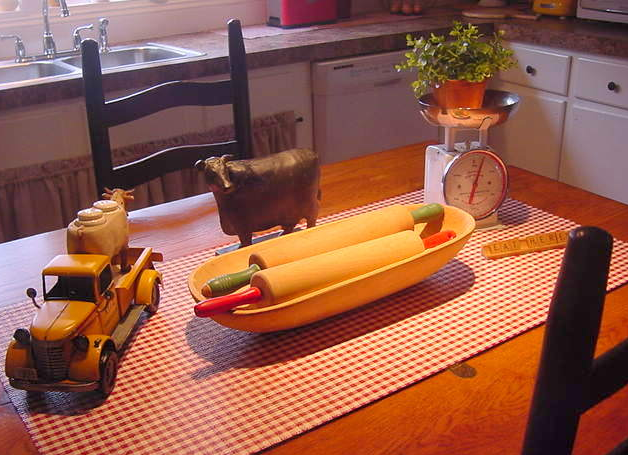 On the Magazine Your Home blog the inspirations and crafts are plentiful. Teresa teaches how to make usable crafts and has useful how to’s with high impacts when finished. She truly does it all; sewing, furniture refurnishing, and even re-covering lampshades. She raises chickens, has horses, gardens and cans. Her little homestead in Alabama would be a perfect place to relax and refresh. Teresa kindly answered a few questions for us. Actually once the cabinets were painted everything kind of fell into place. White always gives me a clean slate to do whatever style and colors tickle my fancy. I think using white paint makes just about anything look good. How did you pre-plan and prepare? I’ve been thinking about this redo for some time now and I like to keep pics of kitchens that inspire me via Pinterest. So when it came to the actual choosing my style I found that most of the pictures I had ‘pinned’ where of white cabinets, wood floors and with a Farmhouse flair. Model/Year/Manufacturer/Size: My home was manufactured in 1999 and is about 2000 square feet. 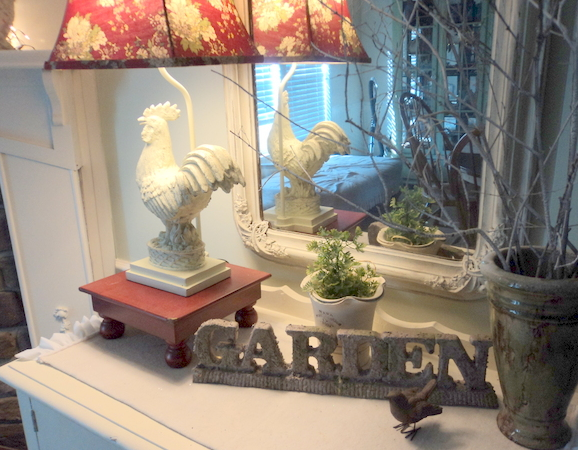 My favorite style: I like a mix of cottage style, farmhouse, traditional and whatever strikes my fancy. My Inspiration:I love Pinterest and browsing design blogs. I’ve gotten so many great ideas from other do it your selfers online. Favorite room/place in home: I love my family room right now since I just redid my fireplace surround. My favorite room is always the room I’ve just completed because I gain a little more expertise with each room I do so the next room benefits. Biggest Challenge so far:My biggest challenge so far has been the walls with the battens :(, I’m just not a fan of them and rather than taking them down and filling in with joint compound or caulking I’ve just learned to work around them. Mainly I have used bead board to cover a lot of it up. I also have learned that just paint and decor takes the focus away from the battens. I’m also not happy with the ceilings and I will eventually cover them with bead board as well. What friends say: Many of my friends have wished they had bought a mobile home after seeing that you can transform them into a home you can love at a price you can afford, rather than having a huge mortgage on a regular home. Biggest Embarrassment: The outside of my home, basically the underpinning is not finished and this makes me crazy. Hopefully, that will be remedied this summer. Proudest DIY moment: The first room I transformed was my guest bath. It turned out wonderful and gave me the confidence that I could actually do whatever I wanted to my home. Biggest Indulgence: Laying down wood flooring has been the biggest indulgence at this time. However, I’m so happy we did it as it has made a huge difference. 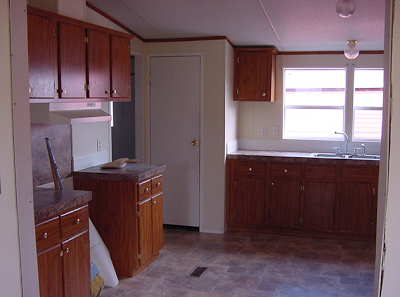 Best advice: Do whatever you feel like when remodeling your mobile home, there are no obstacles that you can’t overcome. It’s your home, make it beautiful! Sources of materials/supplies for remodel: Lowe’s, Home Depot, Habitat for Humanity (great resource for materials at a great discount)! You can view my makeovers at magazineyourhome.blogspot.com It is hard to believe Teresa has only been there for a year and a half. I can’t wait to see what she does this next year and a half! It will certainly be a place anyone would be proud to call home. If you like blogs with lots of crafts, wonderful inspiration and gorgeous home updates, Magazine Your Home should be on your favorites list. Hi there! 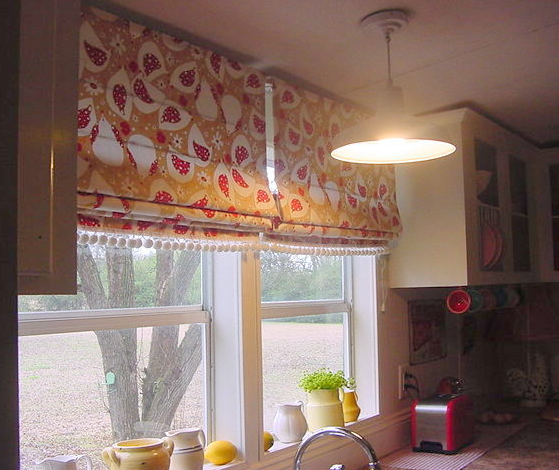 Where did you get the fabric for your roman shade? I just love it! Do you have plans for the bucket pipe light fixture? If so, my hUs and would love to have them. I think she may have done it without any plans but hopefully she’ll see this and can help you! I love everything about this makeover…from the bucket lighting fixture to the farmhouse truck (old yeller?) to the touches of red and the roosters! I love it but how do you paint over laminate cabinets? What brands of paint and primer? Here’s an article I wrote about painting the vinyl coated walls, cabinets are the same concept. No sanding, lots of cleaning, primer, and light coats is the basic how to. in the article theres a list of paint that has worked well for other. I love your kitchen so adorable…………..